Jeff is currently working on applications or awaiting information from family members of several veterans who are potential LoH nominees. All those with a family member who has not received this prestigious award please contact Jeffrey directly at jeff_kine_57@icloud.com or call our S&D chapter member Bill Wright at 425-922-9229. The French Government approved the French Legion of Honor and French Knighthood for the following 442nd Veterans, and each veteran/family has been presented with the honors. CONGRATULATIONS to the Veterans and their Families. Photo above: Mr. Guillaume Maman, French Honorary Consul in Hawaii, decorating Mr. Kenneth Yoichi Sugai (97), G “George” Company, 2nd Infantry Battalion, 442nd Regimental Combat Team with the French Legion of Honor – Chevalier in June 2018 as his daughter Gwen looks on. Mr. Sugai was a Browning Automatic Rifleman (BAR) and wounded twice in the Vosges Mountains near Bruyeres, France during World War II. 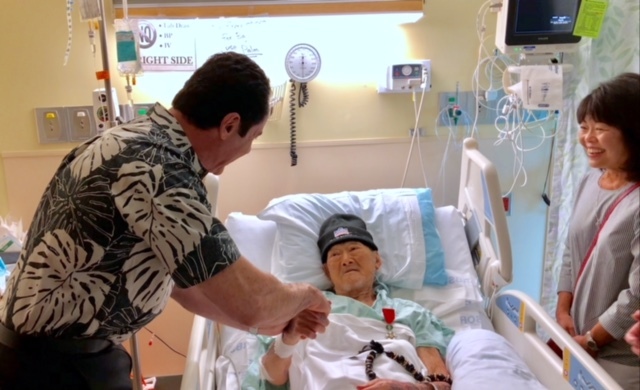 Jeff Morita who nominated Mr. Sugai offers his public service to any current surviving 100th/442nd veteran for this prestigious foreign honor. Photo courtesy of Mrs. Theresa Maman. This entry was posted in 442 Sons & Daughters Events-Meetings-News, E-newsletter, Other RCT Veteran Related News. Bookmark the permalink.